Come and enjoy a relaxing holiday or action-packed adventure on the River Murray with the historic township of Mannum within walking distance. It’s the perfect location for a family holiday enjoying countless water activities or for couples to relax and enjoy the serenity. 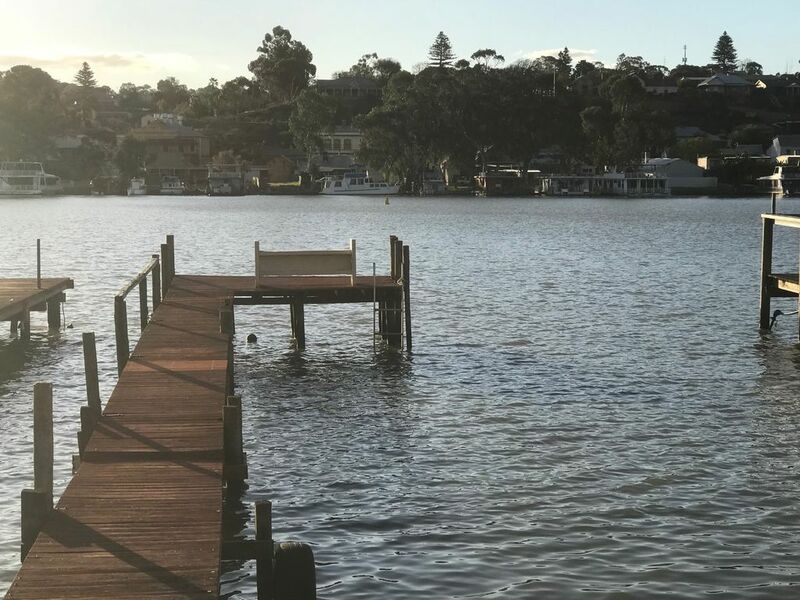 We offer an original 1950’s river front property located within Bolto Reserve, this is a quiet and peaceful location where you can relax, take photos, watch the birdlife under the shade of the river red gum trees or throw in a line and fish off the private jetty. Enjoy a leisurely walk along the jetty and river’s edge whilst the paddle steamers and house boats go by. Watch the ferries or even take a short ride to the other side of the mighty River Murray and wander through the main street of Mannum. Spend time at the local farmers market, have coffee or ice-cream and browse the antiques shops. By all means pick up supplies at either of the two supermarkets in town and have a BBQ on site or eat out taking advantage of the country style bakeries and hotels. The kids will have fun with a large grassed area to play cricket, throw a frisbee, kick the football or bounce all day on the private trampoline. Water activities are a must, bring your boat and utilise the private jetty and ski beach with the boat ramp only 300 metres away. Take the children for a swim, knee-board, tube ride, water ski or perhaps go fishing from the boat. Parking for cars and boat trailer is available at the rear of the property on the paved area. In the cooler months of the year bring firewood/blankets and toast marshmallows in the private fire pit on the property. In the warmer months spend time on the elevated balcony enjoying a glass of wine, watch the sunset and enjoy the gentle breeze coming off the water. We have recently bought this property (May 2018) having fell in love with this quaint country town, the property’s spectacular waterfront location, all within a picturesque reserve. We are restoring the property in keeping with its history and charm, whilst providing a memorable holiday experience for all to enjoy! Parking for cars and boat trailers is available at the rear of the property on the paved area. Cars and trailers are not permitted to park on the lawn area. Clean and tidy with everything you need, just needs a little bit of repair due to its age. A second hand rail on the steps is a must. We thoroughly enjoyed our Murray-side holiday. This cabin hideaway had just about everything we could possibly need, including a soothing water’s edge view. Also Mannum has some great eating-out options, which meant dinner was only ever a gentle stroll and a ferry ride away. Had a great stay beach area good for the boat and kids and everything we needed was there.